Your baby is/isn't doing something you're worried about. You turn to your friend, Google, and search away. You inevitably land on a discussion forum. Some other poor mom has already posted a similar question describing your situation. She's looking for feedback, help, advice, etc. Let's say, she's searching for information regarding sleep. Yes, that sounds familiar. "Blah, blah, blah, doesn't sleep, blah, blah, blah, any help is appreciated!" And here is where the responses flood in. You get three kinds of responses. "You need to make that baby cry. It's not the end of the world. Of course it's heartbreaking, but if you don't s/he will NEVER sleep on his own." "You should look into the Ferber method. Babies need to learn to self soothe. It's skill just like any other that they NEED to learn and YOU NEED to be the one to teach him/her." "I just let them cry it out. They're changed, fed, burped, too bad son. Off to bed." "They're testing boundaries. If you don't leave them to cry they will always think they run the show." "Do NOT let that baby cry. Babies need their moms. Our society is too caught up on baby sleep. You need to listen to your instincts. Babies cry for a reason--because they need something. If you ignore their cries you will scar them for life." "You should co-sleep. It will help you and the baby get more rest. There are tons of benefits to co sleeping. They include..."
"It is TOO early to sleep train. You will permanently damage your child. There are studies out there that show that sleep training puts babies in distress. They don't owe you anything. Do not sleep train." "Babies in orphanages are silent because nobody comes to their aide when they cry. After I witnessed that first hand, I vowed never to sleep train my child." "I'm really sorry that you're going through this. This too shall pass, just do what you feel is right." "I read this book _______. I didn't follow it exactly, but I took the things that worked for me and my parenting style and it really helped." "I'm in the same boat, it's so hard to know what to do. Just follow your gut. They won't wake up all night forever." And there you have a short and not-so-sweet version of what usually lends itself to mommy wars. There are usually two sides (and a whole lotta gray) in all areas of parenting. One side feels they're right and the other feels they are absolutely right and they fight it out. Advice for new moms often feels like you've been caught in the middle of a political campaign. And I think I've figured out why. In every side-there's a supposed potential sacrifice made and a supposed potential benefit. And mom's want to feel like they are making the right sacrifice for the right benefit. Babies can't really talk and there is supposed scientific evidence in favor of both sides. So we're left to our own devices when it comes to figuring this out. Response A mom's are potentially damaging their children by making their kids cry(=sacrifice) They are making a potential lifelong damaging sacrifice in the hopes of developing potentially lifelong habits of good, independent sleep (=benefit). Response B mom's lose sleep at the moment and have the supposed possibility for their child to ever develop good solid sleep habits (=sacrifice) in the hopes that their children will benefit from a secure attachment and knowing that their cries are answered (=benefit). For me, anyway, every choice I make, while directed by instinct, often feels like a gamble. You feel like you are taking a chance no matter what you do. And so our defenses are up and we are ready to fight. To argue. To defend our choice. But the thing is, as moms, we are all making sacrifices each and every day. And if we would be a bit kinder and more quick to recognize that, we might now yell so loudly. And if we didn't yell so loudly, maybe these choices would seem less daunting. We're doing it to ourselves. We are the ones scaring ourselves. We're the ones making this a gamble. While I've chosen to co-sleep and not make JaiseAnn cry, I don't think that parents that do are permanently damaging their child. If they feel their child is ready and they are following instincts, I fully support that. If we gave each other more permission to follow our instincts and fewer warnings, I think we'd be a much happier bunch. Do you agree? 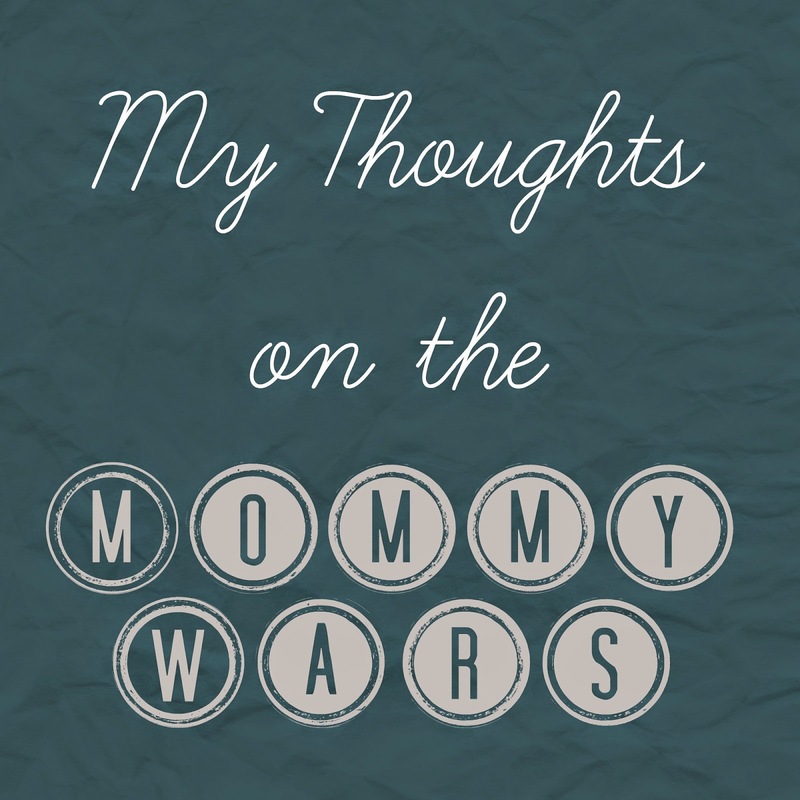 Where do you think the mommy wars come from? What is a hot topic for you personally?